Will Caterham Defy Purists And Embrace EVs And Autonomous Tech? If so, then what would be the point of these track wonders? Car manufacturers have wildly differing opinions when it comes to the future rise of autonomous car technology. Aston Martin, for example, sees it as inevitable that the manufacturer will one day adopt self-driving tech when the technology has evolved, even if it contradicts its reputation as a luxury sports car manufacturer for driving enthusiasts. ‘Driver’s cars’ don’t get much purer than Caterham’s lightweight, track-tuned machines, yet the company’s CEO is embracing the future prominence of autonomous and electric cars. “Every time someone talks about autonomous or electric cars, I see it as an opportunity," Caterham's CEO Graham Macdonald told Autocar in a recent interview. Macdonald didn’t elaborate any further however, so his comments are open to interpretation. Adopting autonomous technology could be an asset to Caterham. A self-driving Seven seems highly unlikely, but implementing autonomous driver assists could potentially help owners develop their driving skills on the track. 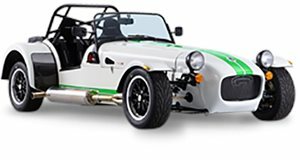 Further down the line, an all-electric Caterham seems inevitable if the manufacturer is to remain relevant - particularly when Tesla has proven that EVs can outperform their fuel-powered counterparts. Mercifully, Macdonald assures that the firm will always focus on what it does best: making fun, lightweight cars that offer undiluted driving pleasure -something that enthusiasts will always demand no matter what the future holds for the auto industry. Caterham’s future seemed shaky at one point, but Autocar reports that the manufacturer is currently working at full capacity. In contrast to a few years ago, business is booming – there’s a 12-year waiting list, and the company is making a solid profit thanks to new manufacturing techniques.